At All About Lifting & Safety, we have over 80 years combined experience in supplying the highest-quality heavy lifting equipment in Australia, including load rollers which are perfect for flat surfaces. We stock a wide range of styles, sizes and features which are sure to include exactly what you’re looking for. Because we stock such a large variety of load rollers, our team of All About Lifting & Safety experts are waiting for a personal consultation with you to guide you through the selection process to make sure you have the right, industry-standard choice. At All About Lifting & Safety, our team of qualified engineering experts take a lot into consideration when choosing the right load roller for you and your heavy lifting needs. We always put our customers’ needs first and work in close consultation with you, to make sure you have the best product starting from when you walk in the door. Nylon wheels. Our rollers come fitted with nylon wheels to ensure minimal marking on floors and surfaces when moving the heavy goods. Multimodal operation. Our wide range of load rollers offer both swivel and fixed operation models to cater to your specific lifting needs. Weight capacities. 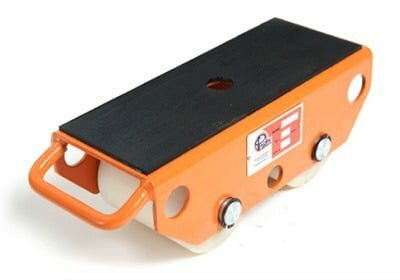 We stock several load rollers that can cope with light weights up to heavy, industrial weights. High-visibility colours. The safety of your staff and equipment is our top priority, so we make sure each load roller is fitted with high-visibility colours for safety while transporting the heavy goods in the workplace. At All About Lifting & Safety, our experience gives you the knowledge you need but our industry innovation will help take you and your business into the future. Call us today for expert advice on load rollers. Our experts are ready to help. All About Lifting & Safety is an accredited supplier and safety inspector, so you can be assured you are getting the highest quality equipment to keep you and your team safe. Don’t risk safety by going with an inferior supplier. Contact our team today for reliable and professional service and safety products.